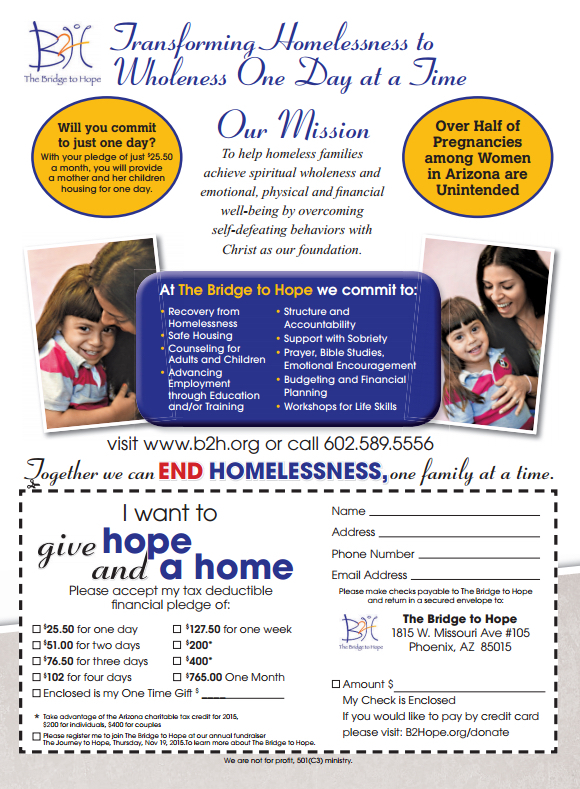 The Bridge to Hope is a qualified Arizona Charitable Tax Credit program. Thank you for your interest in The Bridge to Hope, a transformational housing ministry for homeless single mothers. Arizona Charitable Tax Credit! When you donate to The Bridge to Hope you receive a dollar-for-dollar TAX CREDIT on your Arizona State Taxes. Arizona tax payers can now lower their tax liability and support The Bridge to Hope. The Arizona Charitable Tax Credit allows you to donate $400 per individual or $800 per married couple filing jointly to to a qualified non-profit, like The Bridge to Hope. Contributions decrease your tax bill, or increase your refund dollar for dollar donated to The Bridge to Hope. Donate Today Online! Or mail your contribution to The Bridge to Hope. We can always use monetary donations, no matter what time of year it is. Receiving financial contributions permits us to continue to provide transformational housing to one family at a time. Sending your tax deductible contributions directly to us is the most efficient way to donate, reducing our handling costs. Give hope and a home to a single mother by mailing a check or contributing with your credit card. 100% of donations made on this site go to worthy causes, like The Bridge to Hope. Learn the essential facts every donor should know. Are your RMD’s causing more taxable income? 70 1/2 or older, you can make a gift from your IRA account to help support the ministry of The Bridge to Hope and satisfy your required minimum distribution. Gifts made from your IRA (up to $100,000 this year) are not reportable as taxable income. They also qualify for your required minimum distribution (RMD) which can lower you income and taxes.